ZONGSHEN outboard motors are Italian products of the brand Selva Marine. Their only difference is that they are assembled on a large industrial site in China. Chongqing Zongshen-SELVA Marine Co., LTD was founded on January 23, 2007 as a joint venture between the Chinese industrial group ZONGSHEN and the manufacturer of outboard motors from Europe, the Italian company SELVA Marine S.p.A.
Italian company SELVA Marine S.p.A. Founded in 1945 by the talented inventor Lorenzo Selva. To date, SELVA boat engines are manufactured in Italy and successfully compete with famous brands from Japan and America. The secret of such popularity of SELVA outboard motors is in the simplicity of their design and phenomenal reliability. The Chinese industrial group ZONGSHEN has been leading its history since 1992, when entrepreneur Zuo Zongshen opened his motorcycle repair shop in Chongqing. Today, ZONGHSEN plants are among the five largest moto manufacturers in China. ZONGSHEN also cooperates with the famous European manufacturer of scooters and motorcycles by the Italian concern PIAGGIO. Combining the long experience of Italian developers of SELVA outboard motors and the industrial capabilities of China's largest ZONGSHEN-based motor production, the joint venture Chongqing Zongshen-Selva Marine Co., LTD produces high-quality outboard motors and sells them at a reasonable price. ZONGSHEN boat engines are fairly reliable and competitive engines made in China. The products of the concern have quite good performance characteristics and demonstrate good preparation for domestic operating conditions. 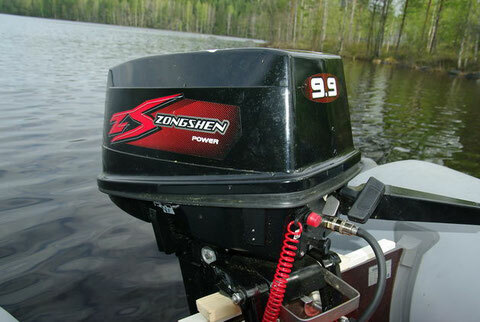 The main series is represented by two-stroke products, which are perfect for people who are fond of fishing or hunting. Convenience in management and transportation. A comparative test drive proved that Zongshen boat engines are in no way inferior to products of American or European brands. The only major difference is the pricing policy.